The aftermath of a deadly boat explosion was caught on camera. 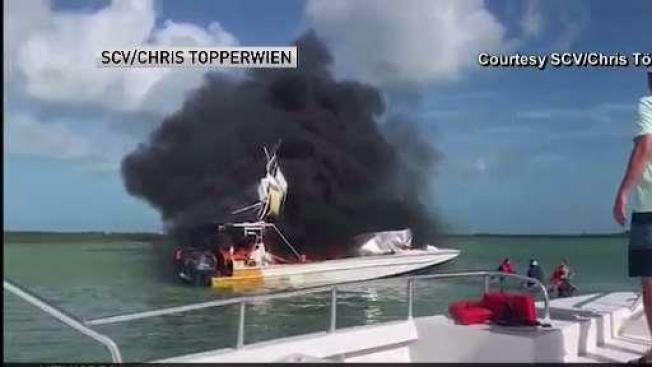 One person is dead and nine others were injured after a boat exploded in the Bahamas on Saturday. The explosion happened at 11 a.m. near Exuma. Twelve people were on board at the time of the explosion, 10 Americans and two Bahamians. Four passengers that were injured were airlifted to a hospital in Clearwater. The extent of their injuries are currently unknown. Passengers from a neighboring boat captured the aftermath of the explosion on video. Investigators are still working to figure out what caused the explosion.